Nant y Car South lies in the community of Llanwrthwl in the county of Powys. It is located at Ordnance Survey national grid reference SN8859360873. The mine is recorded in the CPAT Historic Environment Record as number 18994 and this number should be quoted in all correspondence. There are three parallel north-south striking lodes in the valley bottom. The lode explored at Nant Y Car included copper and lead mineralisation. There is a main engine shaft and southern adit close to the dressing floors with a possible earlier blocked adit to the west by the side of the Rhiwnant stream. There are traces of trial workings to the west on the outcropping rock. The mine is reached via a trackway which now passes through the Rhiwnant Farm from the Claerwen Valley. This was presumably the main access for miners travelling to Nant Y Garw also. There are numerous covered stone leats on the dressing floors one of which carries water from the crusher wheelpit to the buddle while another takes water from this wheelpit to the stream. 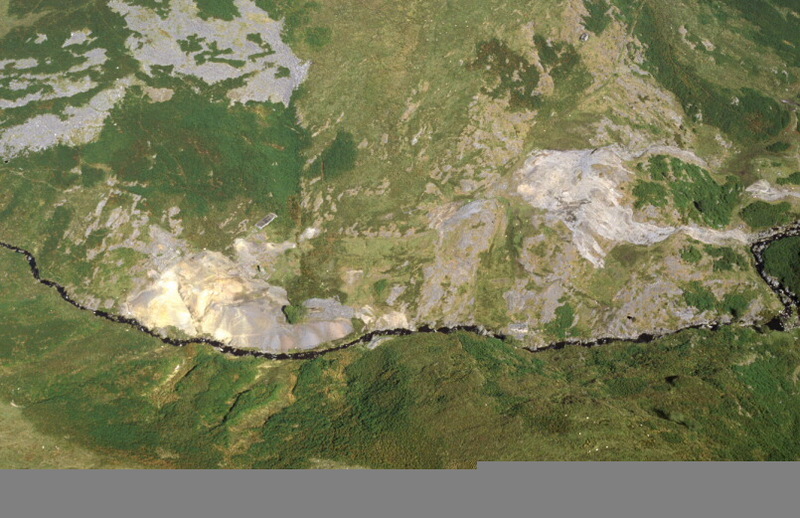 Another leat can be seen running from underneath a large spoil tip south of the crusher. There is a ramp to the rear of the crusher for tipping ore onto the rolls and there are remains of tramway track beds leading from the shaft to the ore bins. The wheelpit attached to the crusher also powered the pumping rods which connected to the engine shaft. The balance pit can still be seen. There are two ore bins with a picking/washing floor below. There is a platform next to the ore bins, and at the same level, which was presumably also used for rock storage. Jiggers appear to have been placed in the open area south of the ore bins and picking tables judging by the proximity of jig tailings at this location. There is a single round buddle east of the crusher house with surrounding walls and terraces to the north. The crusher house has four remaining beam ends in the wall indicating the use of two crusher rolls. The crusher wheelpit has been buttressed on the south-east corner at some stage. The crusher room stands to 4.30m in height. The first floor beam sockets are at 3.20m and approx. 1m above the crusher rolls. There is an attached structure north of the crusher room which may have been a concentrate storage area.